Call or come by our shop any time. 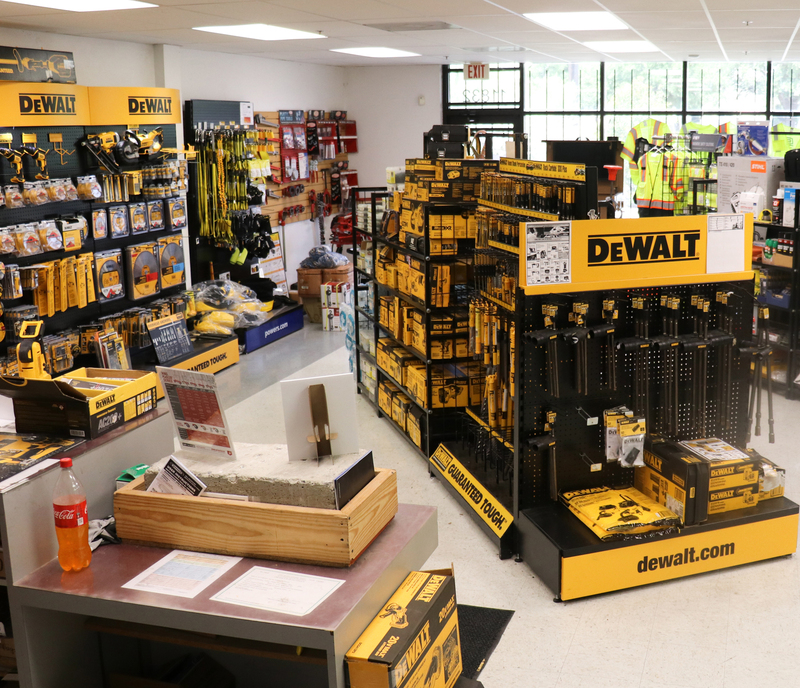 We look forward to helping you with all your construction tool, fastener and safety-equipment needs. The second annual DeWalt Race Car Sale event in San Antonio was a success with the help of beautiful weather in the low 70s on Friday, April 12, 2019. On April 4, United Tool and Fastener had the privilege of sponsoring and presenting at the 1st annual C3 Career Fair in the Fort Bend Independent School District Wheeler Field House in Sugar Land. In a Houston AGC Safety Committee meeting, KASK representative, Jason Cashmore, explained and demonstrated what makes KASK safety helmets exclusive and an asset to the safety industry and construction. March 3-9, 2019 marks “Women in Construction Week” by the National Association of Women in Construction (NAWIC). United Tool and Fastener (UTF) is proud of its long-standing tradition of employing a significant number of women in its Houston office. DeWalt released its newest laser products: high-quality, professional-grade lasers at competitive prices. The February 2019 AGC Houston Safety Committee meeting breakfast was sponsored by United Tool and Fastener, and featured presentations by Orthopedic surgeon, Dr. Masson, Dan Gilbane of Gilbane Construction, and Jason Cashmore of Kask (safety helmets). Jim Kollaer of Construction Citizen talks with Bobby Williams about the operations, business philosophy, and values of UTF. An Outside Sales Representative’s job necessitates determining, generating and capturing the sales outside the organization. Responsible for assisting in a variety of warehouse duties, including shipping and receiving, unloading and loading trucks, fulfilling purchase orders, and keeping warehouse stocked with essential equipment. Contractors in the Houston area should get to know the local, Sugar Land-based company, Elite Components, that offers high-quality hanger, strut and strut-related products to the plumbing, electrical, fire protection, HVAC and construction industries through United Tool and Fastener. There are presently no openings. Please check back for new position openings. United Tool and Fastener is proud to be a part of the upcoming 1st annual C3 career fair on Thursday, April 4, 2019, as a sponsor and safety representative. The event, which will be held from 7am to 3pm at the Fort Bend ISD Wheeler Fieldhouse in Sugar Land, is part of a greater C3 initiative to educate students about careers in construction. KNAACK offers products, distributed through United Tool and Fastener, that enable necessary safety equipment to be contained in a movable storage cabinet that can be locked while keeping equipment dry and organized. United Tool and Fastener (UTF) carries the Unistrut brand because a quality, yet simple product yields customer satisfaction, which is key to UTF ideology. United Tool and Fastener is excited to announce the arrival of ‘Shop utandf.com,” where customers can find discontinued items for sale. On Friday, Dec. 21, 2018, United Tool and Fastener participated in D.E. Harvey Builders’ (Harvey) celebration of reaching a major safety milestone: one entire year of no accidents on a job site. Winter has finally arrived, and United Tool and Fastener has all the cold-weather gear necessary for staying warm while out on the job or relaxing with friends. United Tool and Fastener has partnered with Firestop Specified Technologies Incorporated (STI) to bring the construction industry the fire-prevention products and knowledge they need to complete a job and make it the safest site possible. DeWalt Flexvolt Holiday Hot Buy! Read more about DeWalt Flexvolt Holiday Hot Buy! The more than decade-old holiday giving of United Tool and Fastener, San Antonio, continues again this year in what has become an eagerly-anticipated yearly tradition. United Tool and Fastener’s Safety Specialist, Charlie Gertson, was recently named the Associated General Contractors of America (AGC) Houston Chapter Safety Co-Chair for the upcoming 2019 and 2020 years. United Tool and Fastener is sponsoring the 1st annual C3 career fair on Thursday, April 4, 2019 from 7am to 3pm. Attention Deer Hunters! Have you ever tripped while out with your gun because you can’t see what is in front of you? Are you looking for the perfect holiday gift for the avid sportsman? We at United Tool and Fastener have the solution you have been seeking. Despite forecasts for rain, the Nov. 7 United Tool and Fastener Houston One-Day Sale drew crowds in sunshine, with customers nabbing some of the best deals of 2018. United Tool and Fastener owner, Bobby Williams, is excited to show off the revamped Houston showroom. United Tool and Fastener will be displaying and offering the Night Tech Gear Night Shift Shoe Lights at a discounted price at the upcoming One-Day Sale on Nov. 7 in Houston, Nov. 8 in College Station and Nov. 13 in San Antonio. Anticipation is building as the upcoming 2018 United Tool and Fastener blowout One-Day Sale in November creeps closer. The event will occur on Nov. 7 in Houston; Nov. 8 in College Station; and Nov. 13 in San Antonio. UT&F has an immediate opening for an Outside Sales Representative in the Houston area. Brian (Yezierski) at United Tool and Fastener does a very good job for SWECS. His pricing is competitive and his product knowledge is excellent. He updates us on new products and helps us find solutions to our problems. We rely on Brian at United Tool and Fastener for help in our fast-paced industry. Despite rain in the forecast and showers off and on throughout the day, the first Houston DeWalt race car sale event drew curious customers eager to examine the DeWalt Nascar, enjoy a delicious lunch, and take advantage of exclusive one-day specials. United Tool and Fastener is carrying the PIP Black Label ANSI type R class 3 4-in-1 reversible multi-seasonal windbreaker with detachable sleeves. The first DeWalt Race Car Event sale in San Antonio was a success despite forecasts for rain and a wet start to the morning of Thursday, Sept. 20, 2018. Job Summary: We are currently looking to fill the position of Warehouse Manager for our San Antonio location. Applicant must be able to handle daily operations of the warehouse, including freight, shipping and receiving, returns and transfers. 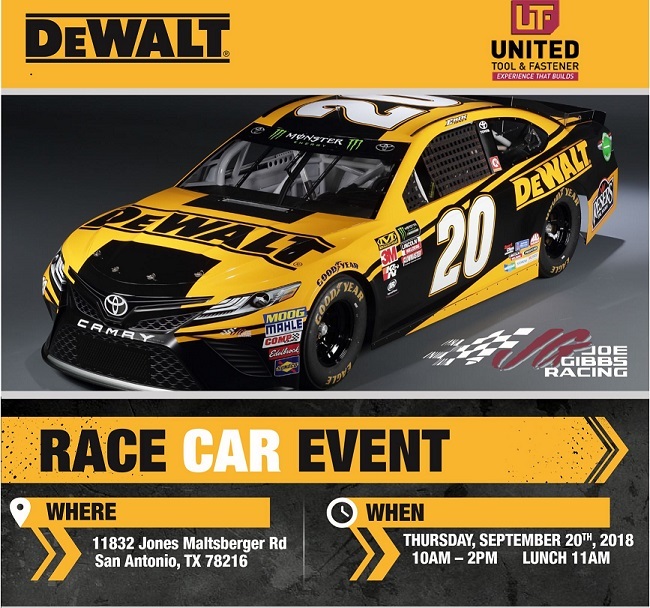 Join us at our Houston showroom on Sept. 25 from 10am-2pm to take advantage of special, one-day DeWalt Race Car sale event pricing in-store only. Join us in San Antonio on Sept. 20 from 10am to 2pm to take advantage of the DeWalt Race Car sale event. Special prices good in-store only. On Sept. 12 to 14, United Tool and Fastener participated in the 2018 OSHA Safety and Health Conference in Houston at the Westchase Marriott hotel. Milwaukee launched the latest addition to their extensive sub-compact battery system: the M12 Fuel™ 3-in. Compact Cut Off Tool. United Tool and Fastener is now carrying the Sundstrom Silica Dust Respirator Kits, which feature the ultra-efficient Sundstrom P100 particulate filter that removes approximately 99.997% of all types of particles. United Tool and Fastener is pleased to announce the arrival of its first shipments of the new KASK safety helmets. A team comprising United Tool and Fastener salesmen, Chris Smith and Howie Wright, and DeWalt representatives, Josh Tucker and Austin Veteto, took 2nd place at the 2018 AGC Houston Golf Tournament. Milwaukee launched its new line of “Next Breakthrough” M18 products, and United Tool and Fastener is proud to be selling them. Accidents can happen anywhere, but in the construction industry, it’s especially important to have safety on the forefront of everyone’s minds. Therefore, having an updated ANSI first aid kit on each construction or work site is a top priority. United Tool and Fastener is excited to announce the launch of Metaltech’s newest product: drywall stilts. All UTF showrooms (Houston, San Antonio and College Station) will carry the economical and sturdy drywall stilts. United Tool and Fastener carries the safety clothing products of Protective Industrial Products (PIP), which enable those in the construction industry and beyond to remain safe while working. PIP offers a wide range of safety products, including clothing such as vests, hats, gloves and glasses. Protective Industrial Products (PIP) recently launched a new line of hard hats made specifically for performance and affordability. United Tool and Fastener (UTF) sponsored and participated in the 14th annual Shrine Sportsman Fishing Tournament in Matagorda Harbor, Texas, on June 23 with 31 teams participating. UTF has been a part of this annual fishing tournament nearly from its beginning. JOB SUMMARY: To operate a light delivery/panel truck or similar vehicle to pick up and deliver parts, materials, and finished products. To service customers in the local area. On June 15, United Tool and Fastener outside sales representative, Brian Hybner, participated for the second year in the ABC/CMEF Fishing Tournament by helping to organize and run the tournament. United Tool and Fastener is excited to announce the expansion of Werner’s Fall Protection line of products with the addition of the Max Patrol Self-Retracting Lifeline series with Leading Edge SRLs. Do you need safety training for your workforce? Contact Charlie Gertson at 713.823.9016 or charlie@unitedtoolandfastener.com to set up your appointment. United Tool and Fastener (UTF) will sponsor the 14th annual Shrine Sportsman Fishing Tournament in Matagorda Harbor, Texas, on June 23, 2018, which supports the local Houston/Galveston Shriners hospitals. United Tool and Fastener (UTF) partnered with the Associated General Contractors (AGC) for the very first annual Military May Shootout on May 30, 2018. UTF was a major sponsor of the event and specifically of the gun raffle. United Tool and Fastener carries the latest Pacific Laser Systems’ (PLS) lasers, making layout tests and markings easier and more accurate. PLS carries an entire series of lasers for those in the construction industry to make their work a little easier. On May 30, United Tool and Fastener (UTF) will team up with Associated General Contractors (AGC) to host the 1st annual Military May Shootout from 3:30pm to 7:30pm at the Boyert Shooting Center, 1200 S. Mason Rd in Katy, Texas. The 2018 National Safety Stand-Down and Safety Week benefit the construction industry by showcasing safety and solutions. United Tool and Fastener (UTF) assists in solving the industry’s safety pitfalls by presenting safety and fall prevention demonstrations in the greater Houston, San Antonio and College Station areas. United Tool and Fastener carries the innovative Fluke T6 Electrical Testers with FieldSense technology that measure voltage up to 1,000 V ac through the open fork, without test lead contact to live voltage. Working in electrical boxes jammed full of wires is challenging when trying to find a safe metallic contact point. 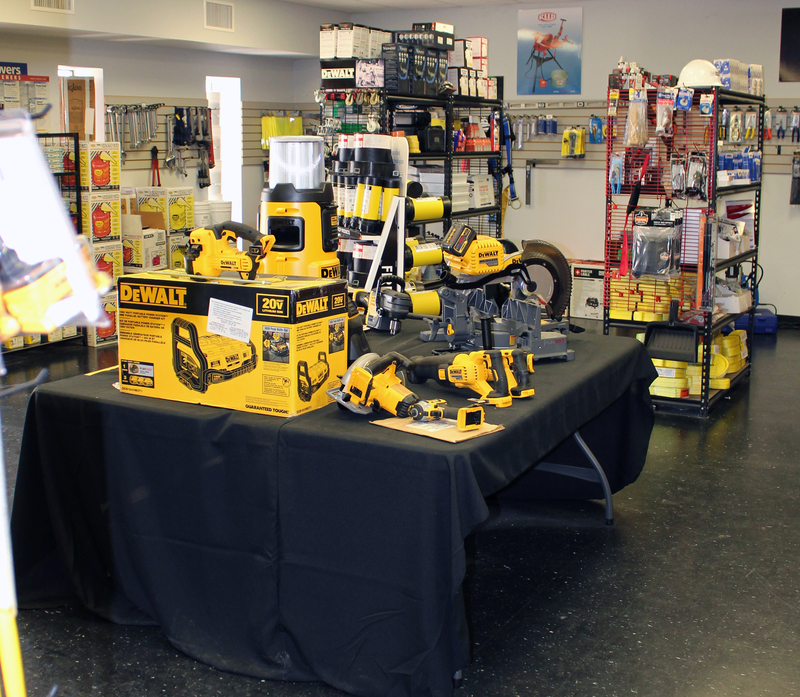 The 2018 DeWalt Spring Fling one-day sales in College Station at 12600 Hwy 30, Suite 300 on May 9 and in San Antonio at 11832 Jones-Maltsberger Road on May 10 showcased new products and special pricing. United Tool and Fastener teamed with DeWalt on May 2 in Houston for the 2018 DeWalt Spring Fling one-day sale at 6320 North Shepherd. In Palmetto Bay, Fla., Werner safety harnesses ensured that two construction workers did not fall to their deaths after a scaffold partially gave way. Visit the Houston showroom from 9am-2pm to take advantage of fantastic prices on DeWalt tools for one day only and watch demonstrations of some of the newest DeWalt products. Read more about Ramset Training: What Type of Tool Should I Use? The March 22 Milwaukee Spring Sale in College Station enticed both new and old customers from throughout the area to partake in exclusive pricing, delicious Crawfish and beautiful weather. Join us in San Antonio from 10am-2pm at our one-day DeWalt Spring Fling Sale. Come shop our vast inventory of tools and take advantage of spectacular pricing on DeWalt products for one day only in addition to watching demonstrations of some of the newest DeWalt tools. Meet us in College Station from 10am-2pm for a one-day Spring Fling Sale on DeWalt products. Take advantage of our unbelievable pricing on our vast inventory of DeWalt products and watch new tool demos. In late April 2018, United Tool and Fastener will begin stocking the new Milwaukee® M12™ Compact Inflator. Meet us in College Station for a Milwaukee counter day. Take advantage of our unbelievable pricing on all Milwaukee products and new tool demos. On Feb. 23, 2018, United Tool and Fastener (UTF) sponsored the AGC February monthly Safety Committee meeting. Keeping customers happy and building new relationships is at the heart of what has made United Tool and Fastener a thriving company for more than 30 years. United Tool and Fastener’s San Antonio Milwaukee Counter Day was garnered a ‘great success’ with representatives on-site to show off the latest tools and accessories and answer questions. Visit our showroom and enjoy some fresh coffee and breakfast and browse our vast inventory! 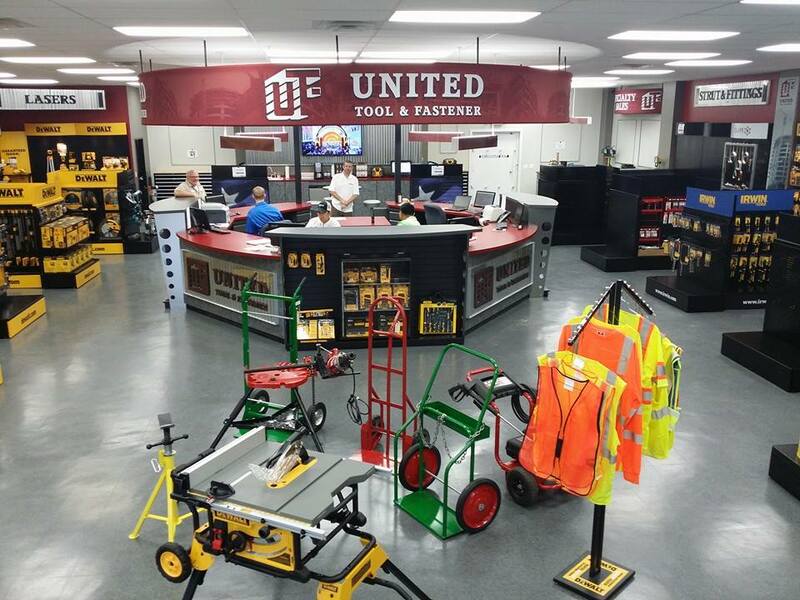 In early February 2018, the United Tool and Fastener College Station showroom’s Milwaukee display was completely refreshed and updated. Come to the Showroom and enjoy some free coffee and breakfast and browse our vast inventory! It is common knowledge in the commercial construction industry that there are particular OSHA standards which must be followed; however, many workers in the residential construction industry may not know that OSHA has standards for that industry as well. Therefore, it is difficult for workers to adhere to standards if they don’t even know they exist. Meet us in San Antonio for a Milwaukee counter day. Take advantage of our unbelievable pricing on all Milwaukee products and new tool demos. Come to the Showroom and enjoy some free coffee and doughnuts! AMST has done business with United Tool and Fastener for mainly unistruts and spring nuts. I recently met sales rep Laurie Chin; she has helped us purchase quality tools and supplies for our shop at lower prices with great turnaround and very good customer service. We are really pleased to know there are still companies to do business with that still care. I look forward to doing much more business this year with Laurie and UTF. United Tool and Fastener is kicking off its Q1 DEWALT specials, which include a special promotion on select DEWALT power tool accessories. The promotion is valid through the end of March, while supplies last. United Tool and Fastener is excited to offer the newest DEWALT GUARANTEED TOUGH® Jobsite WiFi Access Point (DCT100) system in January 2018. The Access Point is tough enough for the jobsite with simple setup and adaptability for the construction industry, and is a solution that works. For at least the last ten years, United Tool and Fastener, San Antonio, has participated in “Construct a Kid’s Christmas,” which is administered by Construction News. Various UTF employees in addition to customers come together to give all they can muster to buy bicycles for children under the care of the Bexar County Child Welfare Board. Many accidents, and even deaths, from falling in the United States are preventable with the right training. Even using a ladder necessitates training in the correct ways of use and ways to prevent falls. “Over 100,000 accidents from falls occur each year,” United Tool and Fastener Safety Training Specialist and OSHA Outreach Instructor, Charlie Gertson, said. We are looking for a capable Warehouse Associate to support our company’s warehouse operations. You will receive, input, sort, load and unload products and perform various warehouse activities. Since OSHA set new respirable Silica dust regulations that went into effect in Sept. 2017, contractors must use equipment that meets those new rules. DeWalt has Silica dust equipment to meet those new OSHA regulations. They affect any jobsite that deals with grinding applications. There are specific engineering controls that can be put into effect to meet the new rules. Do yourself and your company a favor, and contact Brian Yezierski or Amy Sexton at United Tool & Fastener. Awesome service and very knowledgeable in all aspects of employee safety and tools to get the job done-big or small. The only regret we have is not joining the United Tool & Fastener team sooner! Rain in the forecast for Wednesday, Nov. 1 couldn’t dampen the UTF spirit for its Houston One-Day Sale, where buyers could get some of the best deals of 2017. “The One-Day Sale was a huge success. Through all of our efforts, we have turned this into an event that our customers have really come to enjoy. And, the chance of rain ended up being a blessing,” UTF President, Bobby Williams, said. On any given day in the United States, two people on average die per day from falls (approximately 750 a year). Many of these deaths and accidents are preventable with the right training-especially for those who work in the construction industry. “Over 100,000 accidents from falls occur each year,” United Tool and Fastener Safety Training Specialist and OSHA Outreach Instructor, Charlie Gertson, said. Come to the College Station Showroom for our One Day Sale! Come to the San Antonio Showroom for our One Day Sale! Come to the Houston Showroom for our One Day Sale! The L6200 series Fiberglass Leaning Ladder is ideal for the professional. With a duty rating of 300 pounds, it features the LEANSAFE™ ladder top that secures tools and accessories, and is uniquely designed to securely lean against flat wall surfaces, wall corners, poles, and wall studs and perform as a standard stepladder. Read more about Connect With Construction Experts. We're always looking for industry professionals who are ready to make a difference in their careers and the construction community. We offer competitive salaries, generous benefits, and believe the best place to work combines a challenging environment, technical advancement, and rewarding compensation. Join us. We offer competitive salaries, generous benefits, and believe the best place to work combines a challenging enviornment, technical advancement, and rewarding compensation. Join us. When distributors talk about being a single-source supplier, they are typically talking about the strategy of providing everything their customers need, from power and hand tools to accessories, fasteners and other consumables. There are many such single sources or “one-stop shop” distributors across the nation.